$90 million – that’s how much Netflix spent on production of their very first blockbuster, outbidding several studios in what must be a first for the streaming giant. It’s also a price tag that comes with a fair bit of talent attached; outside of star Will Smith, it’s written by Max Landis, the guy who also wrote Chronicle and Victor Frankenstein among a few others, and it’s directed by David Ayer, himself fairly well-known by his peers for big and gritty crime flicks… and also Suicide Squad. So, that’s $90 million spent on making Landis’ concept of a Tolkien-esque fantasy world colliding with a dirty cop flick a reality… was it worth it? Really, Netflix? Was it worth spending more money than you’ve ever spent on an original film thus far for something like THIS? I mean, props to you for allowing Ayer and Landis to make the film they originally wanted to set out and make, but it really isn’t worth it when that project was actually a load of old Orc-shite. 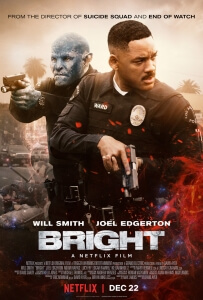 Bright is set in contemporary Los Angeles, only this is a world that shares living space with all sorts of magical creatures from elves to Orcs to even fairies, and apparently humanity isn’t very comfortable sharing their lives with these different races. As the racial subtext becomes so obvious it hurts, we are introduced to human LAPD officer Daryl Ward (Smith) who has been partnered with Orc cop Nick Jakoby (Joel Edgerton), the first of his kind to serve on the force and, because this film really wants to whack you on the head with its “powerful” social commentary, is an outcast because of the way he is. As Ward and Jakoby go on a routine patrol together, they soon come across evidence of a magic wand – an outlawed weapon in this society – and along with an Elf user of the wand, known as a “Bright”, they must stop everyone who wants the wand for themselves from getting their hands on the MacGuffin. While the concept of modern-day fantasy creatures living in the grimy suburbs of Los Angeles may seem like an interesting idea, and one that would use every single penny of that $90 million price tag, the execution squanders all of its potential with quite an unpleasant approach to the material. Despite the hefty price tag, which may be miniscule compared to much larger movies but is still quite a lot for any kind of motion picture, it looks extremely cheap and exceptionally ugly; nothing is pleasant to look at, not the streets which are mostly shot at night anyway, nor the make-up which ranges from hideous to quite creepy-looking, and the whole thing looks like they just shot it all on the normal LA streets and then plastered some unattractive fantasy make-up and CGI all over it. Ayer does nothing to make any of it look or feel interesting, and a lot of the time it seems as though he was on auto-pilot while making this, like he was still recuperating from the editing nightmare of Suicide Squad and couldn’t entirely focus while making this one. He rubs that off on his actors too, with Smith sounding and acting pretty bored throughout a lot of it, while Edgerton is stuck underneath all that heavy make-up without a definable character trait to latch onto. Neither of the leads share any believable chemistry, nor do they even take advantage of the very bizarre situation that they have both found themselves in; like everything else in this film, the actors are taking this strange concept way too seriously, and it prevents anyone from having genuine fun as a result. As for Landis, he’s the sort of writer who seems to have some truly great ideas, but more often than not struggles to find a filmmaker who can truly bring his crazy visions to life. His screenplay for this might have worked a little better with a director who would have likely brought a little more silly fun to it, but even saying that is a stretch; this is a really underwhelming screenplay even for someone like Landis, with clunky dialogue and, again, some explicitly obvious symbolism about racism and police brutality. It’s like he saw Zootropolis and set out to bring the same message to his own wacky fantasy scenario, only he managed to write it in a far more childish and much less subtle manner than the Disney cartoon did; it’s extremely heavy-handed and doesn’t work to bring drama into the mix because the characters are so uninteresting and underdeveloped that you really don’t care, and want it to be over with sooner rather than later. It doesn’t work as a fantasy because there are so many restrictions with its set-up; it doesn’t work as a cop film because it’s heavily clichéd and not the least bit intimidating; it doesn’t work as a high-concept action film because it takes very little advantage of the set-up nor does it look particularly well-choreographed; it doesn’t work as a Will Smith vehicle because this is the least invested the star has been on-screen since After Earth; and it doesn’t work as a dumb but fun kind of bad movie because everybody seems to be taking this really weird idea so very seriously, which makes it not only the bad kind of bad but also a really boring and uninvesting one. It’s certainly a disaster, one that Netflix poured $90 million into so it could at the very least look like an expensive disaster, and it’s not going to encourage the industry that Netflix can do the blockbuster game too, because first impressions are everything in the film world, and this one is pretty lethal. Netflix clearly has a vision of a future where it’s a legitimate blockbuster studio, but right now that future certainly isn’t Bright. Bright squanders all the potential its wacky set-up promises with some ugly visuals, poor direction, clunky and unsubtle writing, and disinterested acting that adds up to a big-budgeted disaster for Netflix and its long-term plan for distributing its own high-concept feature-length material.